There's a stark contrast between old and new taking place in Maison Ikkoku. On a quiet side street, the calm of a quiet Saturday afternoon is broken by the hum of conversation and the hiss of milk being steamed under pressure. The painted brick walls with industrial style copper pipes and light fixtures are far removed from the original shophouse that was here, and are closer to a contemporary urban studio apartment. There are some quirky touches also, with old pieces of furniture suspended from the walls, and doors recycled into tables on an outdoor terrace. An espresso shot is the foundation of many different coffees. 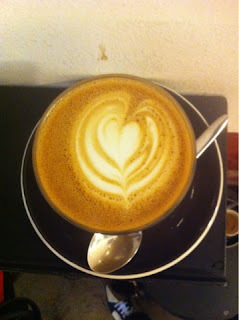 It's hard to make a bad drink with a good espresso, and so much easier to make a bad drink with an over extracted shot. 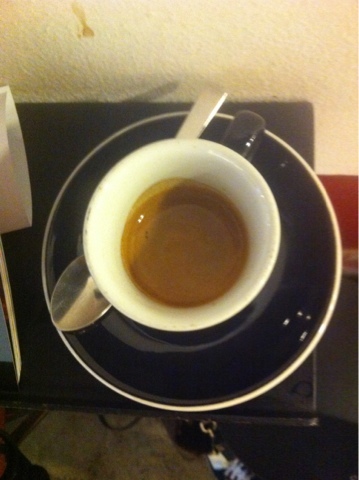 The espresso shot that I ordered arrived with a medium dark brown crema, and a small volume of coffee. (The crema colour is an indicator of freshness. If it's pale, it's stale, which is why I always make a note of this. The small volume suggests that the shot was not over extracted, which would give rise to unpleasant flavours in the shot, as non soluble coffee grounds end up in the cup). It was bitter, with hints of woody flavours, and a slightly thick mouthfeel. The aftertaste was bold and lasting - overall a well executed espresso. So far, so good. I ordered a latte also. The espresso was definitely muted by the milk. It was smooth, with the coffee flavour not lost or drowned out by the milk. However, the overall quality is reduced by the presence of larger bubbles in the milk foam - this is something that I have seen before in Maison Ikkoku. This might seem like the most minor and insignificant point imaginable, but there are valid underlying reasons for pointing this out. Larger bubbles do not impart the same silky smooth mouthfeel that microfoam does. Also, the baristas have gone to the effort of creating latte art. Unfortunately, larger bubbles cause the foam to break apart, so the overall affect is lost after a few minutes. This is something that is fixable, and it's a shame to see their efforts go to waste for the sake of a small change to the steaming technique. It's also the difference between a very good latte, and an average one. One thing to bear in mind however - the point above is simply not relevant for anyone who prefers drip or brewed coffee, and might not even be an issue for anyone else. There is also a good selection of brewed and drip coffees available for anyone with different tastes. Pourover coffees are on the menu, along with cold dripped, syphon, aeropress, andV60 all available as options. Coffee choices include pretty much everything except ristretto shots. That's ok though, there's more than enough on offer. One thing that Maison Ikkoku does well is the pairing of different bean types to different brewing methods, and the baristas are well versed in which method to pair to which bean. This is great to see, and speaks volumes about the cafe, and the owners intentions and reasons for starting. Prices as are expected - $8.50 for the latte and cappuccino above - and broadly in line with what is charged in other quality cafes. Along with Smitten and Chye Seng Huat Hardware, Maison Ikkoku has a very well stocked retail section, with accessories that are not always found elsewhere. There is a good selection of items for brewed or filtered coffees, including Chemex and V60 coffee drippers, cone filters and syphons. There are also tampers on sale for home baristas. Unfortunately, Maison Ikkoku does not sell coffee beans. This is something that I would like to see happen, as there are some interesting blends and single origins from Columbia and El Salvador being used. Overall, there are a good selection of brewing methods available, as well as helpful staff pulling quality shots. The milk steaming issue won't affect everyone, but it's unfortunate to see this when everything else is done so well. Also, Maison Ikkoku can be very crowded at weekends, with queues for seats - opening the second floor cocktail bar during the day would help to alleviate this. It's certainly worth a visit, and along with Symmetry and EspressoLab, is a good choice for anyone craving caffeine in the Arab Street area.